Alexander Khalessi, MD, has been named chair of the Department of Neurosurgery at UC San Diego Health. After a national search, Alexander Khalessi, MD, has been named chair of the Department of Neurosurgery at UC San Diego Health and chief of the Division of Neurosurgery in the Department of Surgery at University of California San Diego School of Medicine. “As a university, UC San Diego is among the youngest and best in the United States. 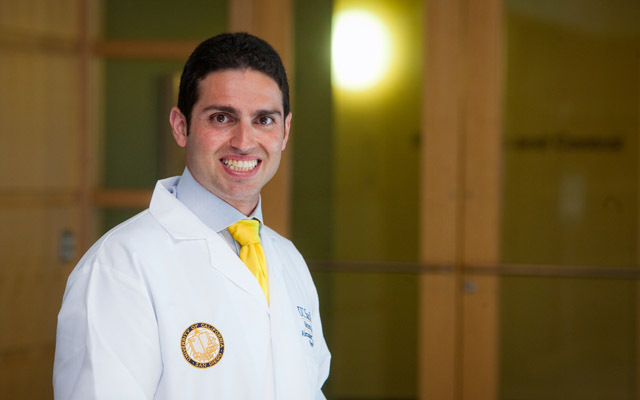 Dr. Khalessi shares this enviable distinction as one of the youngest and most distinguished faculty members to have earned these critical clinical and academic leadership positions,” said Patty Maysent, CEO, UC San Diego Health. An accomplished neurosurgeon, Khalessi is an active clinical leader in complex neurovascular and oncologic care. He has earned international recognition for deploying unique surgical and catheter-based procedures for cerebral aneurysms, arteriovenous malformations (AVM), carotid disease, intracranial hemorrhage, ischemic stroke, and brain tumors. With established thought leadership in medical device innovation, Khalessi has chaired several data safety monitoring boards and clinical events committees for FDA neurovascular device assessment. Khalessi further helped pioneer first-in-man surgical cases for endoscopic evacuation of intracranial hemorrhage and 4K-3D exoscope visualization in neurological surgery. Succeeding Bob Carter, MD, PhD, Khalessi led efforts at Jacobs Medical Center to expand its neurosurgical capabilities through a combination of key recruitments, new technologies and process quality improvements. He also helped lead national recognition of UC San Diego Health cerebrovascular expertise with comprehensive stroke certifications in Hillcrest and La Jolla. Khalessi helped pioneer first-in-man surgical cases for endoscopic evacuation of intracranial hemorrhage and 4K-3D exoscope visualization in neurological surgery. The Department of Neurosurgery includes 19 faculty, 14 residents, 16 staff, and 4 clinical fellows. Department physicians cover UC San Diego Health hospitals in Hillcrest and La Jolla, Veterans Affairs San Diego Healthcare System, Rady Children’s Hospital-San Diego and are actively involved in extending the reach of UC San Diego Health through the Clinical Integration Network. U.S. News & World Report consistently ranks the neurology and neurosurgery programs at UC San Diego Health among the top 50 in the nation. Khalessi is a committed teacher. He served four years on the Residency Review Committee (RRC) for Neurological Surgery, editorial board for the Journal of Graduate Medical Education and helped author Accreditation Council for Graduate Medical Education (ACGME) training milestones for neurological surgery and endovascular neuroradiology. He serves as a Scholar-in-Residence for the American Board of Neurological Surgery (ABNS) and he helped lead the expansion of the Center for Future Surgery to include a microsurgical lab and hybrid OR/angiography suite. Khalessi received his medical education from Johns Hopkins University School of Medicine. He completed his neurosurgical residency training at the University of Southern California and prestigious endovascular neurosurgery fellowship with Nick Hopkins, MD, at State University of New York. He completed his undergraduate education and Master of Science in Health Services Research at Stanford University. Khalessi has published more than 115 peer reviewed papers and monographs with over 150 abstract presentations. He has served as principal or co-investigator of more than 15 clinical trials and grants. Translational research interests include the impact of neurovascular devices on endothelial cell biology. Khalessi is the only neurosurgeon to serve on the NIH/NINDS Interventional Advisory Panel for StrokeNet, and is currently Scientific Program Chair for the Congress of Neurological Surgeons (CNS). He is Fellow of the American College of Surgeons (FACS), Fellow of the American Heart Association/American Stroke Council (FAHA), Senior Member of the Society of Neurointerventional Surgeons (SNIS) and a member of the Society of University Neurosurgeons (SUNS). Khalessi served two terms as President of the San Diego Academy of Neurological Surgery.